This is an old barn in Eastern Washington. It displays the beautiful old-wood colors. 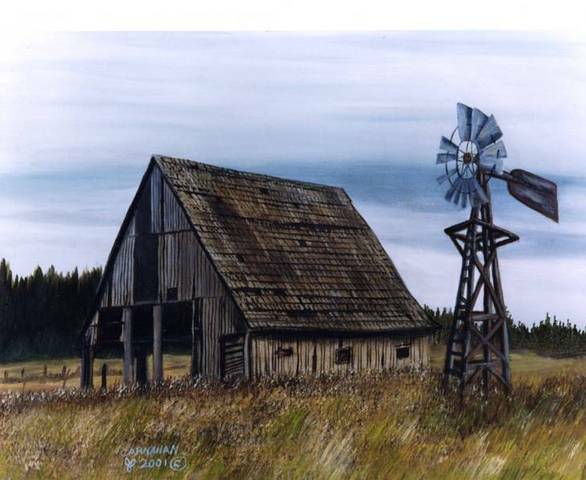 The barn with the old windmill makes an interesting and very popular painting. 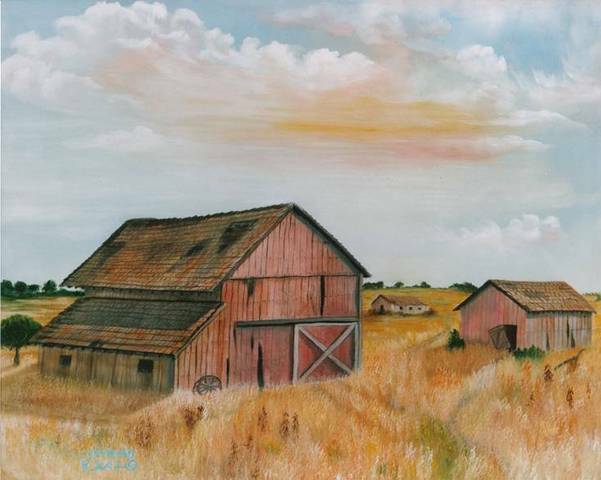 "Days Gone By" #2014Original Sold. An old Farmstead in Northern California. One of the many old Farms with intriguing barns in various stages of decay. Very interesting to paint. A very colorful barn near Hillsboro OR. As seen in the rear view mirror of our van, this barn is across a four lane street from acres of modern Intel buildings. Hence the title of the painting. This old Barn near Goldendale WA with the dead trees around it looks like it has had a hard life . It truly looks abandon. A barn in west Randal, WA as seen several years ago. All of the dense moss on the roof makes a very interesting sight. Currently all that remains of this old timer are a few upright timbers and a few briars covered boards. 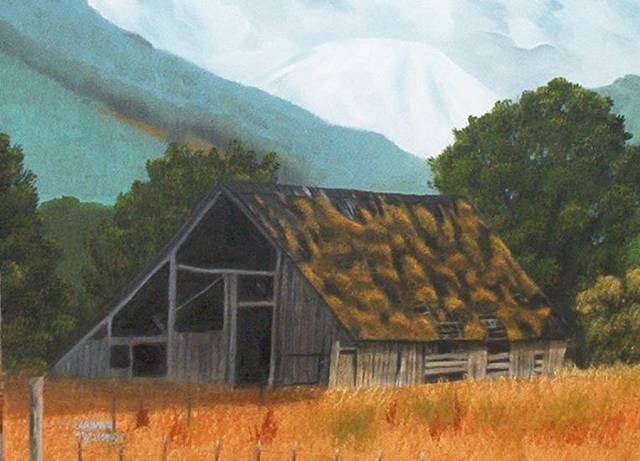 A barn near Goldendale WA which is definitely in need of repair. I have had several people from all over the USA tell me this barn was their Grandpa's barn. Just the same style but not their grandpa's barn. This is a hunters cabin in Montana. The fog floating up into the background trees gives great depth and interest. Part of a farm near Lenore Idaho. 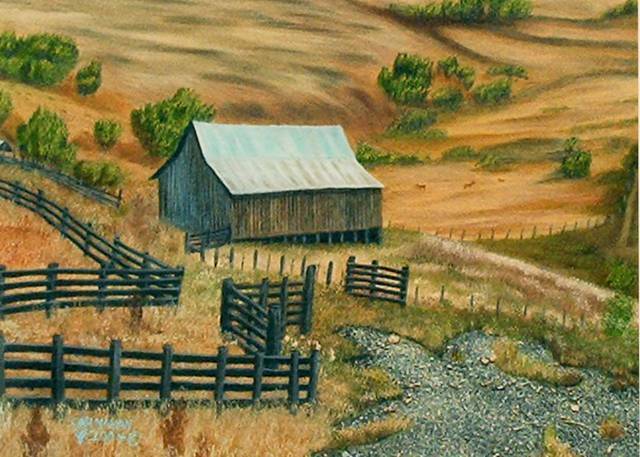 The gravel leading into it, the fence lines along with the terrain and the colors in the building made this a very interesting painting. 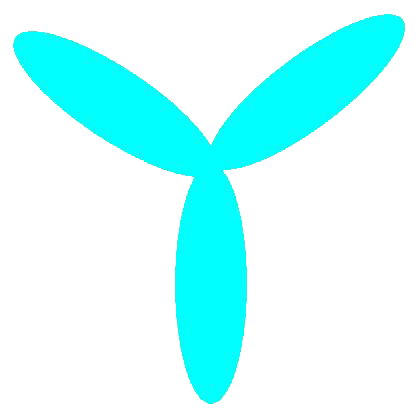 It is called Artist license to add objects to a scene. 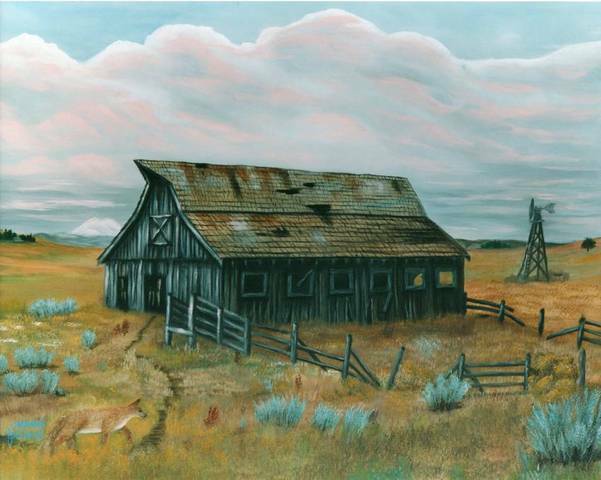 This painting is and actual barn near Goldendale WA, with Mt Adams in the background. I added the coyote and the jack rabbit. This view of the painting is too small for the jack rabbit to be visible.